This 2002 Rickenbacker 4003S8 8-string bass is quite scrumptious. What would you call that finish? It looks like Fender's Aztec Gold but what is that in Rickenbacker-speak? Aztecglo? Owner kept it tuned down a step to relieve tension on the neck, which we recommend, too. Tuned up to pitch bows the neck a bit more then usual on the bass side. C'mon guys, this is a high quality professionally-made instrument from a world-renowned manufacturer, it's not some cheaply-made plank from China. The prospective buyer should NOT have to compromise. If the neck bows more than usual on the bass side, that says to me that this instrument has a problem that needs to be sorted. Don't Rickenbackers have two truss rods? At a guess I'd say, hey, maybe the bass-side truss rod needs adjusting. This shouldn't be a big ask. After all, other manufacturers produce 12-string basses and these can be tuned to pitch, i.e. standard bass tuning (plus octave strings, obviously). The moral of this story? If you want to earn big bucks selling your guitar/bass on eBay, how about spending a few bucks getting it set up properly in the first place? Ricspeak for "gold" is "desert gold"
"Desert Gold". That was Rickenbacker's Color of the Year for 2001. Which makes the bass even rarer and more valuable. And look at that, it's stunningly beautiful. That thing about tuning it down is stupid. There are a set of people who believe in tuning down a 12-string guitar (or equivalent bass)... but really now, if the instrument isn't optimized to play in standard tuning you can't rightly call it a "guitar" (or "bass"). The Rick has a laminated neck, thru body, with two truss rods. It's not going anywhere. 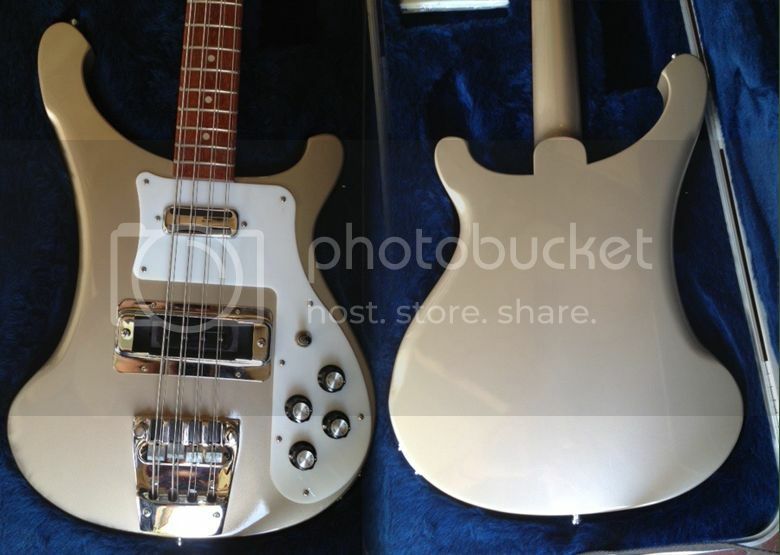 rickenbacker are notorious for thier bad necks. they have two rods in the neck, but neither of them are a conventional, full strength truss rod. i can well believe that putting this bass in standard tune would lead to neck issues. this is after all the company that until 1976 didn't make a bass neck that could handle roundwound strings. the writer is clearly unaware of the rick bass design flaw, where an excess of wood is routed out of the body at the end of the neck, to make room (too much room, as it turns out) for the pickup, & which leaves less than 1cm of thickness in the through-neck; the truss rods cannot compensate for this as they only run under the fingerboard. this is NOTHING to do with the truss rods. my 4003s5 has gone the same way, & the fingerboard is perfectly straight. >sigh< it's nothing to do with the truss rods. my 4003s5 (from 1995) has gone the same way, as did my 1974 4001. the flaw in the design is that too much wood is routed out for the neck pickup, leaving around 1cm of thickness in the through-neck at the end of the fingerboard. so you can get the fingerboard perfectly straight with the rods, & still have the neck canting upwards relative to the body, giving you a high action. the fix for this is to tidy up the neck p/u rout, bend the neck back & fill the rout with a hard block, before re-routing less deeply for the pickup. my 1974 4001 has had this fix & seems to be improved, but I will not throw money at another rick bass.